Often it is the recipes with the most simple of ingredients that really pop. I came up with this zippy fresh vegetarian salad idea nearly straight after I made a homemade pesto recipe for the first time ever in my life. Honestly, I don’t why I waited this long to learn how to make my own pesto sauce. I guess, I am conditioned to think that sauce you buy in a little jar on the supermarket shelf is going to be too complicated to make at home. Boy, is that wrong when it comes to making your own pesto recipe ! For guidance, on how to make my own pesto sauce, I went to the recipe collections of one of the cooking gurus of Recipezaar – Kittencal. As well as having nearly 4,000 (!) recipes posted on Recipezaar, Kittencal also has her very own Kittencal’s Kitchen blog. I knew she had a pesto recipe, so I went looking for it on her blog and found Kitten’s Best Pesto recipe. It was only me in the house and I wasn’t sure if I would mess up making my own pesto sauce. So, I decided to only make a half batch of the pesto. I followed her recipe to the letter with the only difference being that I toasted my pine nuts in a pan just before putting them into the recipe. Want to know how easy it was to make my own pesto? I stuck the basil, pine nuts, garlic and olive oil into my mini chopper. Yup, I didn’t even have to get the actual food processor out. Which is great because I truly hate cleaning up my big food processor after I use it. Then I wizzed it up for a bit before opening it up and chucking in the cheese, some salt and some pepper and giving it maybe about 30 seconds of whizzing. Done! I mean, seriously that was too easy. Of course, the proof is in the tasting. So, I dipped my spoon in and tasted my first ever homemade pesto recipe. I swear, as the pesto sauce hit my tongue it was as if my taste buds came alive and started to dance the can-can. No store bought pesto sauce ever tasted that good. The only problem was that if I was going to stop myself eating the whole batch of pesto sauce with a spoon (which I totally would have done!) then I needed a recipe for it. I took a look in my veggie drawer and really, I couldn’t get past wanting to pare the fresh pesto sauce with the ripe vine tomatoes I had. 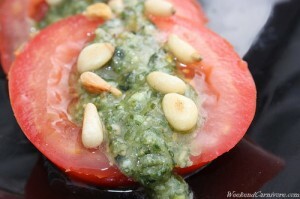 For a while, I was leaning towards doing a tomato and pesto sandwich on granary bread. 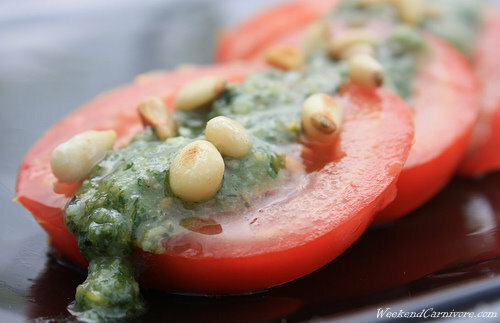 I still think that would taste really good but instead I went for this super fresh tasting pesto and tomato salad. Try this but really, if you don’t make your own fresh pesto for it then you aren’t getting the full impact of the recipe. Try making your own fresh pesto recipe. It really is stupid easy! 1. Lay the tomato slices out on a plate with the ends just overlapping. 2. Drizzle the fresh pesto liberally over the tomato slices. 3. Scatter with your toasted pine nuts and enjoy.